Sega Screams Volume 1 is a demo disc for the Sega Saturn, released exclusively in North America with console bundles. Bizarrely Sega of America released this game twice - initially as Sega Saturn Bootleg II (as a "sequel" to Bootleg Sampler). The product in its Bootleg II form is far less common, though aside from a changed title screen (on some discs), the two discs are identical. 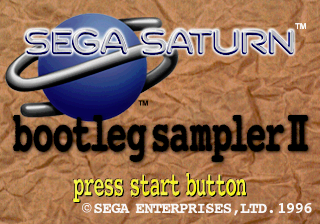 Unlike Bootleg Sampler, Sega Screams Volume 1 opts for the "standard" Saturn demo disc menus often seen in the European Sega Flash series. Sega Screams Volume 1 was followed by Sega Screams Volume 2.